FRIGAST Sterling Silver Seven-piece Flatware Service for Ten in Butterfly Pattern. This rare Danish service is circa 1900-1905. 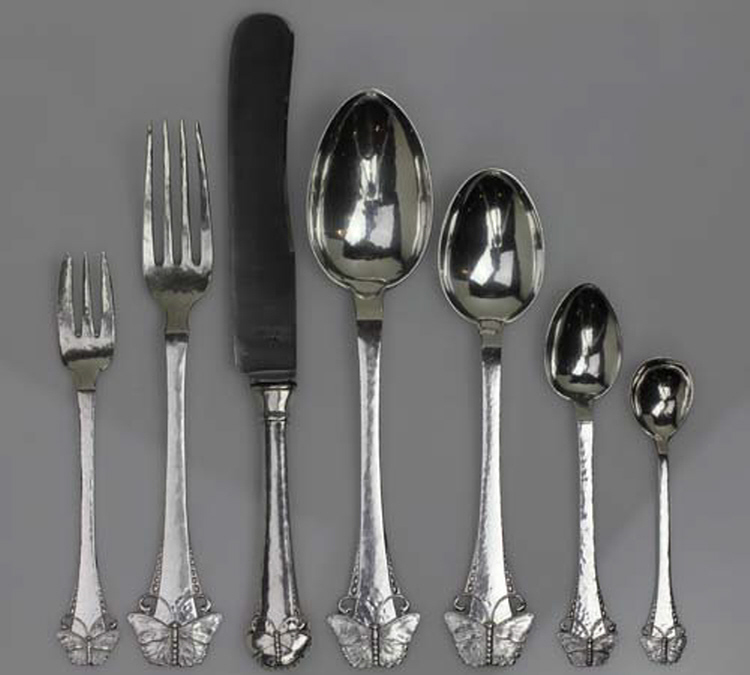 This service consists of the following individual pieces: 10 Dinner Knife (9.625 inches), 10 Dinner Fork (7.875 inches), 10 Dinner Spoon (8.25 inches), 10 Oval Soup Spoon (7.25 inches),10 Tea spoon (5.5 inches), 10 Small Fork (5.875 inches) and 8 Coffee Spoon (4.5 inches). This service also comes with a related sandwich tongs (7.25 inches). Each piece bears impressed company marks for Frigast, Denmark assay mark. The marks on the sandwich tongs are hard to read. The service is in excellent condition. There are 69 total pieces.